What's the point of hooking up high end studio gear and top-shelf microphones with low-grade XLR cables? All of that clarity and pristine audio quality goes right out the window when it hits the first noisy, frequency-imbalanced cable. That's why the pros trust their sound to Monster Studio Pro 2000 Microphone Cables. These cables have it all: Time Correct windings with microfiber-dielectric-isolated multi-gauge wire to ensure accurate and balanced frequency response, double-shielded leads in a MultiTwist configuration to stave off interference and crosstalk, and 95%-coverage copper braid outer shielding covered in Duraflex vinyl to block out external noise - it's all there! Top it off with custom Monster XLR connectors with 24-karat gold contacts and uber-resilient solder joints, all backed by an AMAZING lifetime warranty, and you know your Studio Pro 2000 Microphone Cables will deliver. 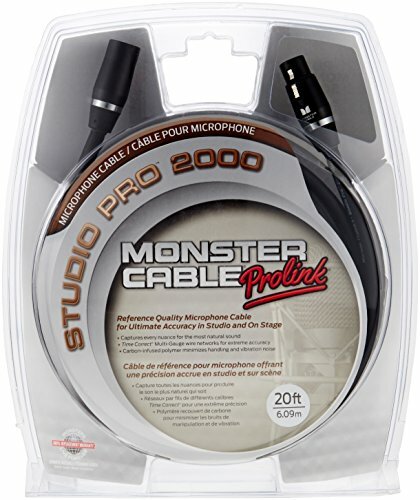 Don't blow your signal path on cheap cables, get your Monster Studio Pro 2000 Microphone Cable from GearNuts.com! Mogami GOLD DB25-XLRM-10 Analog Recorder Interface Cable, 8 Channel, DB25 to XLR-Male, 10 ft.